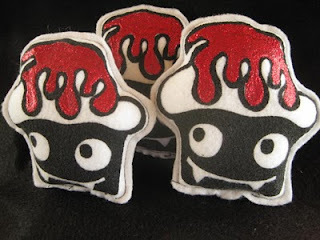 Lola Pearl Bake Shoppe: Plush Vampire Cupcakes! You gotta love Etsy! DogboneArt's Etsy page is selling these adorable plush vampire cupcake toys for $6, just in time for the Halloween season. Brought back from zee dead..muw-ha-ha..Dog Bone Art's original design of the Vampire Cupcake. A new twist with Glittery-blood red frosting on this little guy. Hand screen printed on white felt, he's ready to hang out on your desk or on a shelf for the Halloween season. Measures about 4" tall, printed with non toxic black waterbased ink.